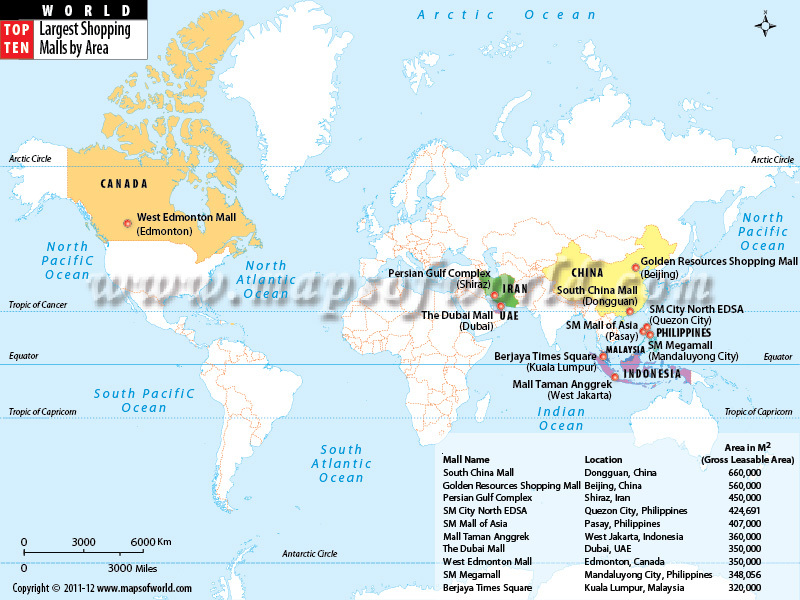 World map shows the location of top ten largest shopping malls by area accross the World. South China Mall is the world's largest shopping mall in Dongguan, China with gross floor area of 660,000 m2. Shopping malls are buildings that form a complex of shops, with interconnecting walkways, and a parking area. Malls are like a virtual traditional market area but coming with a little more zone of convenience and hassle-free shopping. The world map with top ten largest shopping malls by area shows the location of top ten largest shopping malls by area across the world. South China Mall is the world's largest shopping mall; it is located in Dongguan, China with gross floor area of 660,000 square meters. Golden Resources Shopping Mall located in Beijing, China is the world's second-largest mall followed by Persian Gulf Complex in Iran, and SM City North EDSA in Philippines.